A property viewing beyond the call of duty! Marchand Petit are delighted to announce the sale of a unique property - 1 Old Coastguard’s Cottages, Newton Ferrers which was for sale with a guide price of £500,000. 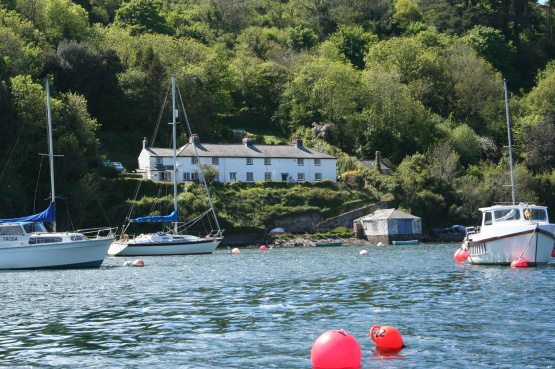 A property only accessible by boat, this didn’t tend to pose a problem as a regular ferry crosses the River Yealm from April to Sept, however when a viewing was undertaken once the ferry had closed for the season, the process became an intrepid adventure! On the wettest day in late October a viewing was arranged that saw the sales negotiator parking off an unmade track about 1.5 miles from the property and walk the SW coast path to reach the house. Too windy for an umbrella and with wellies covered in mud, the journey passed by a neighbouring house sporting a sign saying ‘Beware of the biting dog’ and mentally the agent was processing the external surroundings and recognising alarming similarities with the plot of a James Herriot novel. Once at the property the potential buyer had arranged for a builder to attend who had inadvertently blocked the estate agent’s abandoned car in and who announced that leaving before they did would be tricky. Once the viewing had concluded the agent trudged up the steep path with the builder to find that another car had now blocked them both in! Because of the rain and narrowness of the track the builder’s nice shiny Merc was wheel spinning a plenty and a new logistical challenge became very evident, how to beat the mud. With plenty of head scratching, towing and some very careful driving even Top Gear would have been proud of; all were eventually on their way. After what must have been the wettest and muddiest viewing for the record books it was viewed as ‘all in a day’s work’ and offered useful thought for the office Secret Santa present, which translated into the agent receiving an inflatable dinghy as their reward.